Supported browsers include Internet Explorer 10+, Chrome 3.0+, Firefox 4.0+, Opera 10.61+, Safari 3.1+, iOS 5.0+, Android 4.0+, and Blackberry 10.0+. Preventing conflict in the workplace is not possible all of the time. It is human nature to disagree sometimes, however, a difference of opinion does not have to turn into a heated argument. In fact, conflict can actually be a positive force in the workplace, if and only if disagreements are properly managed and intense verbal disputes are prevented. While you might think this is easier said than done, it is possible to yield a positive outcome from a negative conflict. Dealing with yourself by not allowing negative emotions to take the driver’s seat. Overly emotional reactions often elicit the very negative responses we are trying to avoid and make conflict resolution impossible. Dealing with the person by listening for understanding. Listening for understanding is not just agreeing blindly with the other person, but rather attempting to understand their point of view by asking questions and encouraging honesty in a safe setting. Dealing with the problem. It is crucial that this step is not the first thing you attempt to prevent a conflict from arising. Focusing immediately on the disagreement at hand without practicing self-awareness or listening for understanding does not allow you to get your emotions in check or see the bigger picture. So, conflict resolution happens more naturally once you have a handle on your own responses and have also made strides to positively identify with the other person. 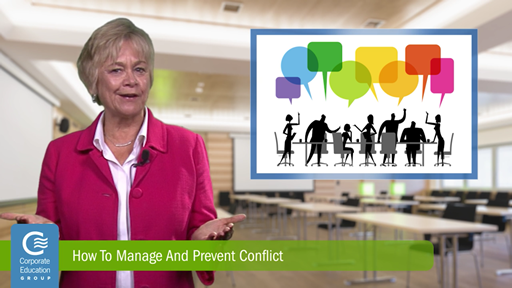 Watch the video for the full details on these tips for managing and preventing conflict.